Swimming is beneficial. Hands down. But, are you aware of the exact benefits? Some of us think that swimming helps in improving the overall physical fitness. Did you know that swimming has meditative qualities, too? This and other little-known swimming benefits are outlined below. Swimming is the only aerobic exercise that is skeletal system-friendly because the body becomes lighter as it is being submerged in water. At waist deep, 50% of the weight is reduced; 25 to 35% at chest deep and 90% at neck deep. The water will bear the rest of your weight, so you can do whatever water-based exercise you want. Resistance exercises build muscular strength91) and tone particularly the quads, triceps, and pectorals. Water is 12x denser than air, which means every movement you do in the pool is relatively comparable to a resistance exercise. While propelling yourself in the water, you need to work your muscles minus the wear and tear resistance workouts bring in. It also targets the under-worked muscles from the lats to traps to deltoids. Since you need to balance, swimming also makes your core and lower back stronger. Locomotion underwater requires coordinated movements of the limbs. Through this, swimming can improve coordination as well as balance and posture since we are constantly moving and standing while in the water. Compared to gym exercises that tend to focus on a specific body part, swimming works the majority of the body parts from head to toe. It also loosens the joints and ligaments. Most importantly, it gives the spine a good twist as you swim from side to side and forward. Speaking of muscles, swimming improves the condition of our heart – the most important muscle in our body. Swimming also makes the pumping of the blood more efficient, leading to better blood flow throughout the body. Studies conducted by the American Heart Association also claim that swimming can reduce the incidence of coronary heart diseases by 30 to 40%. Due to more efficient blood flow to our brain, swimming can make a person smarter. A study published in Journal of Physiology, blood flow increases by 14% when you are submerged in the water at chest deep. 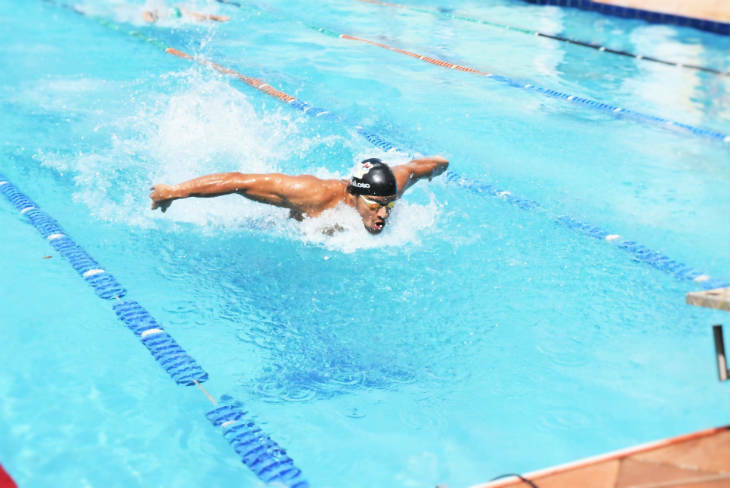 One of the many lessons we can learn from swimming is the proper breathing techniques, which could help in alleviating various symptoms of asthma(2). A study proves that the health benefits of swimming among asthmatic kids who undergone a six-week swimming program are still apparent a year after undergoing the said program. As an exercise, it also increases lung volume. When our face is submerged in water, we naturally learn to use more oxygen. We tend to inhale more fresh air and exhale more carbon dioxide in the process as well. For the diabetics, the American Diabetes Association suggests swimming for at least 150 minutes per week. Swimming is a moderately intense activity that aids glycemic control and increases insulin sensitivity. Also, the activity burns up to 900 calories thereby reducing the risk of type 2 diabetes by more than 10% in men and 16% in women. William Wilson, the author of “The Swimming Instructor,” describes swimming as a happy exercise. It’s because endorphins – the feel-good chemical – are released while you are swimming. Likewise, the sound of the splash of water and one’s own breathing has qualities comparable to the mantras unique to yoga. Such meditative qualities not only relaxes the muscle but also leads to hippocampal neurogenesis(3) , a process wherein the brain replaces the lost cells due to high levels of stress. Based on a research conducted by the Indiana University, swimming on a regular basis can make you look younger by 20 years. All the benefits of swimming discussed above are the same regardless of your age. Swimming knows no age, weight or physical ability. Aside from its anti-aging qualities, swimming also decreases the risk of dying by about 50%. The University of California conducted a long-term study and discovers that swimmers have the lowest death rates. As a recreational activity, exercise or sport, swimming has immense benefits. For one, it is one of the very few exercises that uses all the body parts. Indeed, it can be considered as one of the best activities out there, if not the best.